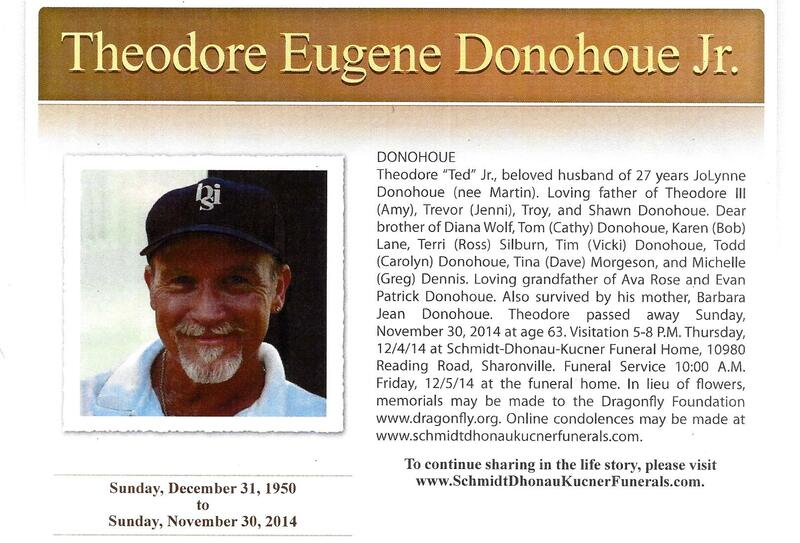 Our brother Ted went to heaven to sing on November 30th, 2014. Rest In Peace. I guess my musical adventure started back in the eighth grade when I got my first guitar. It was an inexpensive, off brand guitar but I didn’t care, because I was going to learn how to play it. So I bought a guitar book and taught myself all of the basic chords and soon I was able to play along with some of my favorite 45’s. Hagee. A friend of ours, Frank “Fritzy” Schatzel, agreed to play drums and we played just about every weekend all around the Cincinnati area. After a couple of years, Mike Russel, a fellow Moeller classmate of ours, replaced “Fritzy” on drums. We had a good sound, and kept quite busy performing all through our remaining high school years. 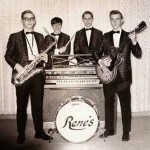 I learned a great deal about music while playing with “The Rene’s”, and have some very fond memories of those days gone by. In 1969, our senior year, we decided to add a bass player and some horns to the group, since Chicago (Transit Authority), and Blood, Sweat and Tears were becoming very popular at the time. At first we called the band, “Sound On Stage” (S.O.S. 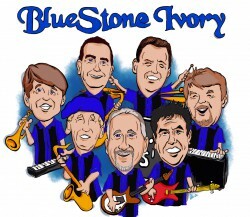 ), but after a short time we decided to rename the group “BlueStone Ivory”, (BSI for short). 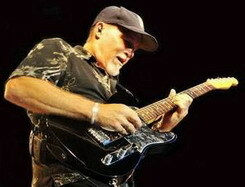 BSI played in most of the popular clubs around town and performed through the years at many of the local high school proms in the greater Cincinnati area. We also played: in the Convention Center, Coney Island, The Gardens, The Coliseum, and even at Riverfront Stadium before a Red’s game. In 1976, after almost seven years of entertaining our loyal fans, the group decided that it was time for a change. As soon as the upcoming prom season was over, “Bluestone Ivory” would unfortunately break up. With this in mind, I decided to take advantage of an opportunity to join a road group, who was passing through town looking for a guitarist. So I broke in a new guitarist for BSI, so they could finish the remaining gigs, and went I on the road. The band I had joined, was called, “The Godfather” and was based out of Charleston, WV. It was a ten-piece show band that did two shows a night, and had a very talented front man who sang and danced like Jackie Wilson. We played in many of the major cities around the Eastern and Central parts of the U S, for over two years. We changed a few members during that time and eventually changed our name to “Supreme Court”. Our group then joined the recording artists, “The Crystals” on tour. (They’re the ladies who had the 1960’s hits: “Da Do Run Run”, “And Then He Kissed Me”, and “He’s a Rebel”.) We played with “The Crystals” for almost a year before we decided to leave and go back out on our own. Not having much success, and only playing half as much as we needed to, the group broke up. The drummer, bass player, and myself, however, had heard about a well-known show band that was based out of Louisville, Ky. that needed some players. So we drove to Louisville, auditioned for the gig, and got it. The name of that group was, “Gary Edwards and Sage”. They had been around for quite a few years and had a very good reputation on the hotel circuit. Gary Edwards had a high energy, Las Vegas type band that tested our musical abilities, and I really enjoyed playing in his group. I played with Gary’s band for about a year, but then the price of gas went up and the expenses of living and performing on the road were no longer profitable. I had no choice but to give my notice to Gary, and then come back home to Cincinnati. The life of a road musician has it’s ups and downs, but all and all, looking back on it, I don’t regret making the choice I did. After returning home, I didn’t play any music for about a year, until I ran into Steve and Terry Etter, two friends that I had grown up with in Sharonville. They both had musical backgrounds, Steve on keyboards and Terry on bass and like myself, wanted to start playing music again. So we decided to start a new band that would play locally. We found a drummer and a second keyboard player who had just got into town and were looking for work. We named our newly formed band, “Impact”. Starting out as a five-piece group we decided to add a sixth member, a female singer, and became the house band at a Tri-county club called “Trumps”. After a successful stay at Trumps, we played many of the hot spots around town for years. I played all through the 80’s starting with the band, “Impact” and ending in a group called “Korporation”. Toward the end of the 1980’s, the clubs in town gradually cut back on the nights they had live entertainment, which made it impossible to make a decent living playing music, and I was forced to give up my musical career. I had no choice but to enter the work force and get a REAL job. I worked a few different jobs until 1992 when I got a call from Ford Motor Company to come in for an interview. Things went well and I was hired by Ford and became an autoworker. And then one day in December of 1998, I got a call from Bobby Myers who was in charge of our 30-year high school reunion. He told me that he was going to attempt to get “BlueStone Ivory” back together to play for the reunion dance, and asked if I would be interested. I thought it might be fun, so I told him yes. We were able to rehearse a couple times a month for six months in preparation for the dance. Then in August 1999, after some 23 years, “BlueStone Ivory” was back on stage performing. The reunion was a BLAST! Everybody had a great time, and couldn’t get over how good the band sounded. The big night came and went so fast that a few of us didn’t want to stop there. However Steve Leigh, our bass player, and Steve “SG” Gallant, one of our sax players, were already in another part time band called, “Toast”, so they couldn’t continue to play with BSI, and we miss their talents on stage. We found some very capable replacements and are now, after much work and dedication, performing around town again. Well, apparently my musical career hasn’t ended after all. Music is back in my blood and I’m having a great time performing with my old high school buddies and new friends and we have all decided to do our very best to keep up the great musical traditions of the horn driven sounds of the original “BlueStone Ivory”. Get your Spring Fling dancing shoes on with BlueStone Ivory this Saturday. goto http://bluestoneivory.com/event/springfling/ for directions. Here is to a GREAT band! On July 11, 2015, we were fortunate to have your band as our wedding band. What a blowout!! Our guests, who came from all over the country were simply amazed at your performance and the fun they had. You “made” our wedding a huge success and no words can ever show our thanks enough for all your efforts. ANYONE who wants to have “the best damn band in the land” perform at their function would be fortunate indeed to book you for their next event. Here is wishing all the gang many more years of happiness and success. Want to be notified of upcoming events Enter your email address and name below to be the first to know.